There isn't any real gameplay to speak of with this one. The premise is following the life of a personified block. Each scene covers an aspect of life that many deal with and the player must spell out the central word. That's it. From early childhood to death, nearly everything one could think of is covered here. 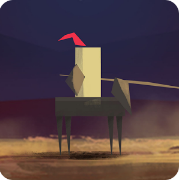 The art style is very simplistic, but it works much in the way Monument Valley does. The real draw is the soundtrack, which as the game recommends, is best experienced with headphones on. It's a haunting and powerful melody that perfectly suits the themes dealt with in the game. I wasn't sure what to expect when I downloaded I am a Brave Knight. It is profoundly emotional and expertly crafted. Don't let the simplistic appearance dissuade you. The game can be completed within 10 minutes, but that is 10 minutes well spent.